If you ever find yourself on a beautiful sea beach under the rays of the burning southern sun, you will see that it is such a wonderful life you are living! 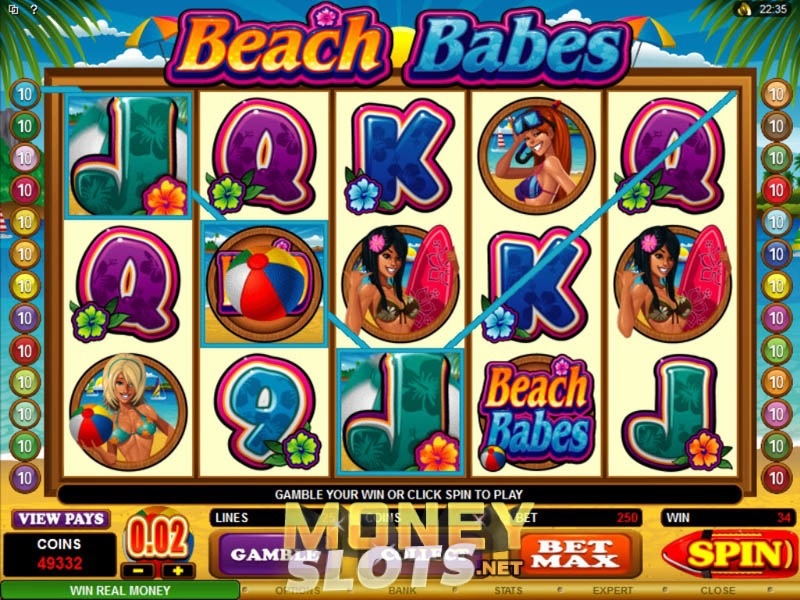 While there is all work and no play, and not a single chance to go on a decent holiday – play the Beach Babes slot machine released by Microgaming. Playing this slot, you will get the feel of a real live resort thanks to the developer. All around you will find pretty girl-surfers with stunning physique. Don’t resist the temptation to play against such picturesque summer surroundings, especially on long winter evenings when the memories of summer are particularly vivid. Before joining the game, every player will first have a look at the payout page. As a rule, all the slots from MicroGaming feature special symbols, the most frequent being the wild symbol. In Beach Babes, you will also come it across, but it is displayed in the form of a game logo. The wild symbol, the essential part of today’s online casinos, can substitute other symbols and increase payouts. If you collect five logos on one active line, you’ll be able to increase your bets by 10,000! This is only a small proportion of what Beach Babes has to offer. When you look at the payout chart, you will surely notice the scatter symbol – a mini-fridge filled with ice. As all experienced players already know, the scatter can initiate free spins, and the Fridge in Beach Babes is no exception. However, to get free spins, you’ll have to collect a minimum of three Fridges on the slot’s reels. After that, you will be presented with 20, 25, or 30 free spins dramatically increasing your bets. To make the game a bit more spicy, MicroGaming offers a special risk game for its players. The game consists in guessing at the club or colour of the card. If the luck is on your side, you’ll be able to increase your wins by two or by four, depending on what exactly you were able to guess. Have a summer holiday in the midst of winter – play Beach Babes!